Light is light, right? Not exactly. The light that comes from the overhead fluorescents at your office is nothing like the light that pours from your favorite chandelier at home or that of the bedside lamp that lets you read your favorite novel to help you fall asleep. That’s because different light sources produce light with different color temperatures. In the early days of energy conservation, everyone recommended replacing incandescent bulbs with fluorescent bulbs because the latter consumed less electricity. But few people liked the tradeoff because of the quality of light the energy-efficient bulbs produced. That didn’t stop Congress from mandating the phase-out of incandescent bulbs, but it did prompt the lighting industry to come up with better alternatives. As you think about which type of lighting to use in your home, you should consider how you can use color temperature to optimize your environment. Here’s everything you need to know. To understand why color temperature is important, you must first understand what it is. This can be a tricky concept, so let’s break it down to basics. Imagine a hypothetical black, metal object—say, the filament of an incandescent light bulb. Now begin heating this filament with hypothetical fire. As the filament heats up, it will begin to glow, first red, then yellow, then white, and then various shades of blue as the flame gets hotter and hotter. Certain temperatures of this flame, measured on the Kelvin temperature scale, correspond to various wavelengths of light from the filament. The bottom end (around 1800 Kelvin, or 1800K) corresponds to the intensely red-orange light from a match or candle. At the high end (15000K and up), the readings correspond to the light observed looking up at a clear, blue sky. The color temperature of your home lighting can have a significant impact. You’re probably familiar with terms like “cool white” and “warm white” lighting, like those you’ve seen on a standard incandescent or fluorescent light bulb. If you read the fine print on the back of a light-bulb package, you might even find an estimated color temperature denoted in degrees Kelvin. Most commercial lighting falls between about 2000K and 6000K, but two color temperature levels dominate. Around 2700K is typically denoted as “warm white” or “soft white.” These bulbs are designed to approximate the typical incandescent bulb, offering an orange-tinted, cozy, “warm” light just like at grandma’s house. Warm light is considered a comfortable, homey light most suitable for use in the home. At about 3500K we enter the realm of “cool white” or “bright white.” Lamps at this color temperature take on a more neutral color and may appear to have a slight blue cast. Standard fluorescent lighting is typically produced at this color temperature, and it’s what you’ll find in most business environments, as light at this wavelength is considered ideal for reading and other detail-oriented task work. A bulb that emits "cool" light is the best choice for task lighting. Note that these are all estimates and averages. 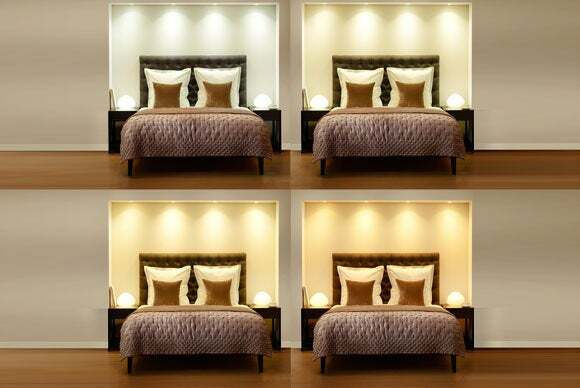 Different bulbs produced with different materials and with different techniques will vary widely in their color temperature. Professional lighting like that used by photographers and filmmakers can vary well beyond this narrow range and can even mix various colors of lights together in a single device. The use of the terms “warm” and “cool” is a bit paradoxical because, when examining the Kelvin scale, you’ll see the “cool” light is actually hotter than “warm” light. The terms warm and cool aren’t intended to describe the actual temperature of the flame used to produce the light but rather the aesthetic these lights generate. As well, color temperature ratings aren’t always entirely meaningful on their own. The color temperature of the sun is measured at about 5600K, but the actual sun itself varies in temperature widely (and reaches into the millions of degrees internally). It is only the visible portion of the energy emitted by the sun that we detect as light that approximates its color temperature rating. If you’ve ever replaced an incandescent light bulb with a fluorescent bulb and remarked about how cold, off-putting, or downright ugly the room looked after your upgrade, you’ve experienced how dramatic an impact color temperature can have. Everything in a room is impacted by the light source in that room. A wall that is white under a 3200K light source can look green under a 4000K light source. That same wall under a 2500K light source may look yellow. This is why designers advise you to place lighting elements and choose bulbs before you paint and furnish a room. “The color paint you pick under the fluorescent bulbs at a hardware store might look very different when you get it under the light bulbs you have at home,” says Cory Bergeron, an author and video production professional. The only thing different in these four views of the same bedroom is the color temperature the LED light bulbs are emitting. The appearance of your room aside, the color temperature of your light can have some subtle and not-so-subtle effects on the way you live and work. Danyelle Kukuk, director of product and category management for Batteries Plus Bulbs, says that bulbs that mimic daylight (in the 5000K to 6500K range) are increasingly popular in a variety of rooms. She notes, “Some customers appreciate having daylight lamps in their bedrooms because the color of the light, mimicking daylight, helps them get moving much quicker in the morning than the warm, cozy soft-white lamps. Also, many of the reading lights on the market are daylight temperature, as the color provides great contrast between black type on white or off-white paper, making it easier on the eyes to read.” Kukuk also says that daylight bulbs are popular in bathrooms, because they make it easier for women to see what their makeup will look like outdoors. 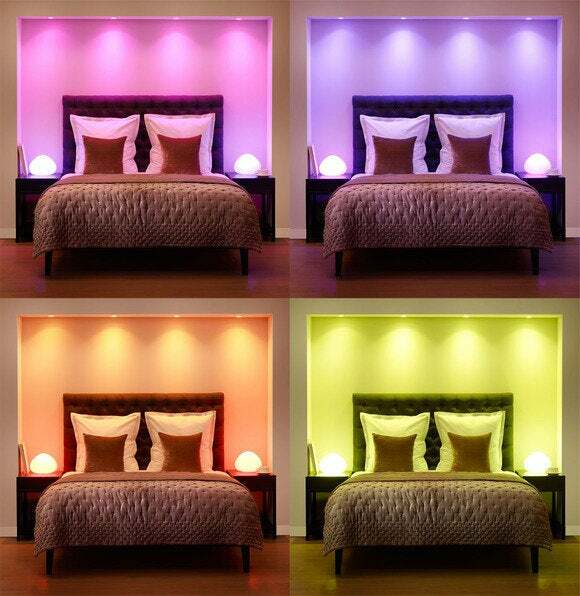 Some studies suggest that light in the blue portions of the spectrum can help you wake up in the morning, making cool white and daylight bulbs especially suitable for bedrooms. “This ‘upper high-Kelvin’ light can trigger a photoreceptor called melanopsin that helps set your body’s daily cycles and can keep you more attentive and alert—so, for example, you can read and study longer, comprehend better, and make fewer errors,” says Michael Gottsacker, director of marketing for Verilux, which sells light-therapy products. 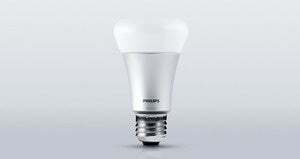 You can find "soft white" connected LED light bulbs on the market for less than $20. Examples from Cree and GE are shown here. That said, there’s no real need to replace your warm bulbs with daylight bulbs (which will kill the romantic mood in the evening and can make it tough for you to get to sleep). One option is to simply use the screen of your laptop or tablet to mimic this wavelength of light in the morning to get you ready for the day. No matter what you do to change the light around you, remember that it will impact your mood and your overall health. “Light can even make your immune system work more effectively,” says Sally Augustin, Ph.D., a practicing environmental psychologist. There are a few popular basic strategies when it comes to choosing bulbs for the home. Perhaps the most popular is to select a color temperature you like—typically in the warm light range—and install these bulbs everywhere. This has the advantage of making your home’s lighting uniform, which makes transitions from one room to the next less jarring. Alternately, warm bulbs can be used for the primary lighting in areas like the living room, dining room, bedrooms, and hallways; and cool or daylight bulbs can be used where more attention to fine detail is required. Bathrooms, the garage, offices, the kitchen (particularly fixtures directly over work areas), and focused task lights like reading lamps are good candidates for cool white or daylight lighting. There are no hard and fast rules about where to use which type of bulb. Ultimately, you’ll have to experiment to see which looks best to you in each fixture in the house. But that’s just the beginning. 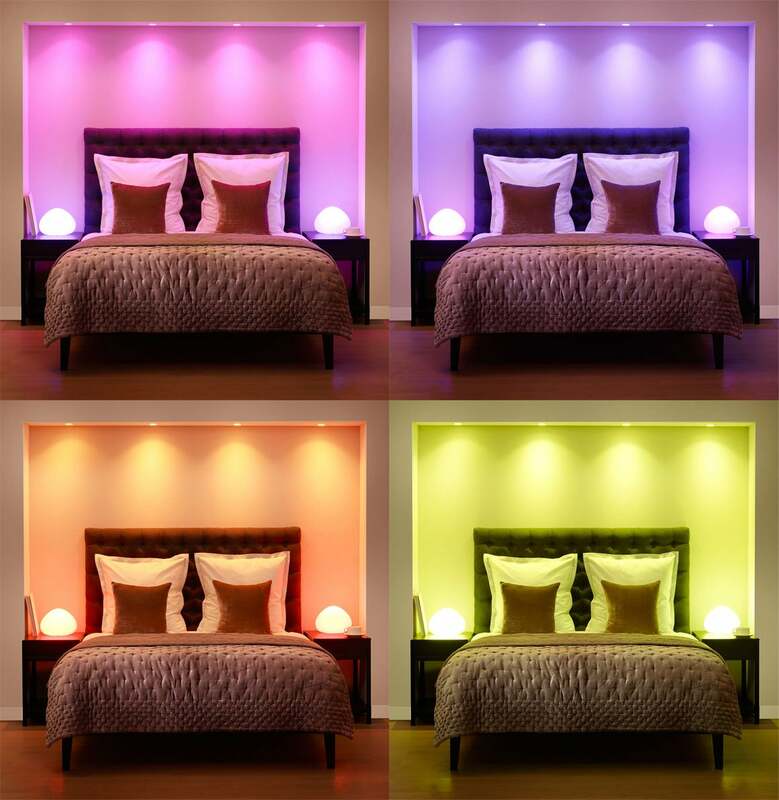 Thanks to the rise of LEDs, which are available in a much wider range of colors than have been available through other technologies, “color tuning” has become an increasingly popular option for consumers looking to really define their homes through lighting design. A new breed of LED bulbs lets you switch between cool and warm light with abandon—or set the bulb to any other color under the sun. 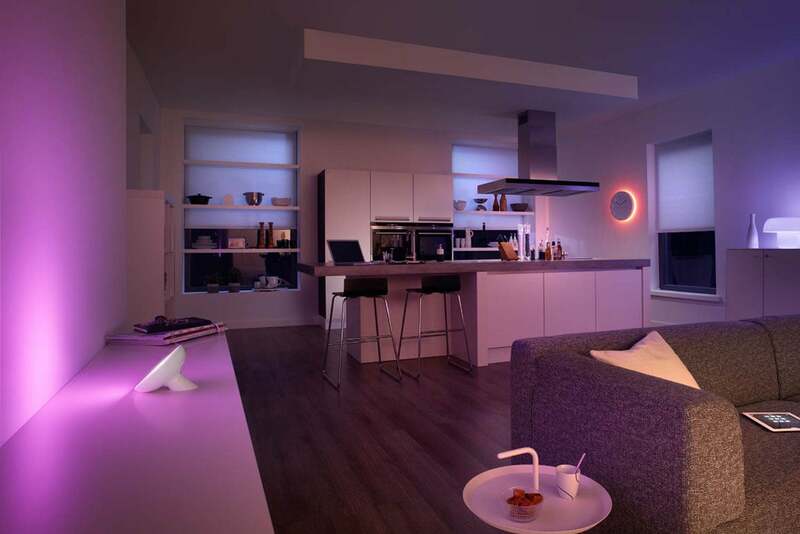 Products in this rapidly growing space include Philips Hue, Lifx,Taba Lumen, Osram Lightify,Cree,GE Link, and iLumi. Each is designed to replace your existing bulbs, and many can be controlled using a mobile app via a wireless network (not necessarily Wi-Fi). Some allow you to use the app to tweak the color temperature (or choose a wild alternative color to set a fun or festive mood) in addition to turning the bulb on and off and establishing schedules for the same.